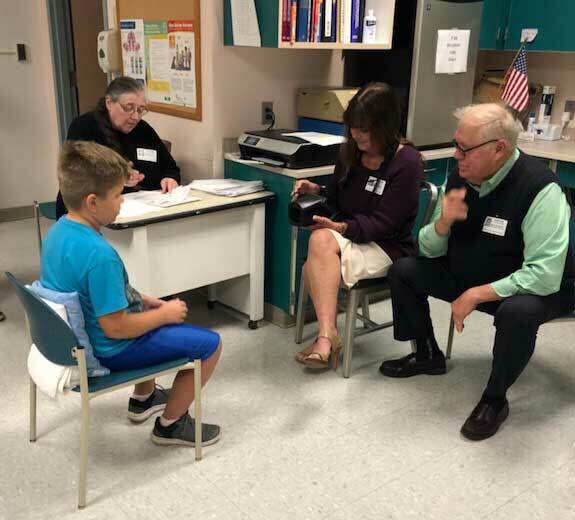 Provided photos: Medina Lions Club member Ann McElwee, back left, and Lyndonville Lions Club members Lynne Johnson, center, and Bruce Schmidt, right, assisted with the vision screenings. 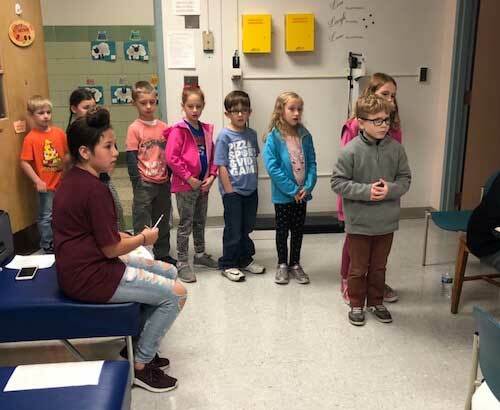 LYNDONVILLE – Lyndonville students recently had their vision screened by members of the Lions Club with assistance of the school’s LEO Club. In one day, 103 students were screened. Parents of those needing additional follow up were notified via letter. The students screened received a sticker from the Lions Club and a pencil, much to their liking. The LEO Club members were a great asset to this process. They were kind to the younger students, cooperative, polite to the guest screeners and hard working. They were neat and clean and looked very professional in their LEO Club shirts. Gratitude was expressed to the group for its help to make the process go smoothly. If any of the families need assistance with eye exams or necessary eye glasses, the Lion’s Club would be happy to assist and those in need should contact Anne Marie Holland, the Lions Club president and the school district’s director of special programs, at 585-765-3107.